A small tree, Spring Snow (Prunus 'Spring Snow') has an attractive spreading habit. Clusters of bluish white flowers appear like blobs of snow on the bare branches. Coppery young leaves provide a lovely contrast with the flowers. One of the Matsumae cherries that has excellent Autumnal colours. A small height tree, so expect a height of up to 4 metres (13 foot) after 10 years. Could go on to grow a little more but this depends on local weather and soil conditions. 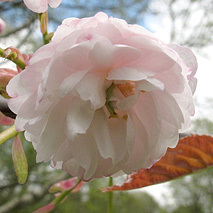 As with most other Japanese flowering Cherry trees, the Spring Snow requires minimal pruning to remove dead, diseased or crossing over branches so could say this is a low maintenance tree. As for soil, the Spring Snow is quite forgiving and will tolerate most soil conditions, those being chalk, clay, loam or sandy. As it is in flowering group 4, expect the blossoms to arrive later in the season. Spring Snow is supplied at a height of between 1.25 and 1.75 metres in a 12 litre container for year round planting. Message card included at no additional cost if required. Just add the information required on the card at checkout. All ornamental trees (not vines) are topped at 1.3 metres to encourage a natural ornamental tree shape with obvious exceptions e.g. patio sizes.This means that your tree was pruned during the growing process and then allowed to grow to the size it is now supplied at. It is more important that that foliage (posh term for leaves) receives the sunlight than the roots. So if the canopy of your ornamental tree can sunbathe but the bottom of your tree thinks there has been a nuclear winter then that is ok. You might want to ensure you have good drainage as water and no sun is the start of algae and other such issues. Do I Need To Stake My Ornamental Tree? 9 out of 10 times the answer will be no, especially if under 200cm tall. However our article on Tree Staking should help guide you. All our trees are banned from overseas travel so that we can state they are all UK grown. We have removed Internet access from the nursery so they cannot book any flights. If any fruits are formed, they will be small, inedible and barely noticeable. 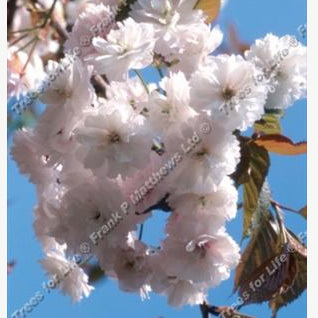 There are cheaper cherry trees out there but you need to make sure that they are the same height and age, VAT and delivery is included in the display price, comes with a FREE TREE WARRANTY, certified virus free, UK grown and not cheaper EU imports used to better weather. A less expensive tree that dies is not cheaper. If you get all that, let us know, we will try to price match.